Paying for search engine advertising, as I discussed in a July column, can be a quick way to attract more visitors to your e-commerce Web site. However, it's not the only way, and probably not the most economical method. If you're willing to invest some time analyzing your Web site and its visitors, you can tweak your pages to improve their natural exposure in search engine results. Clicks from visitors you attract in this manner won't cost you money. However, it will take longer--up to three months or so--before you see the results of your efforts. The key to making your Web site search-engine friendly is to look at it critically, much like a search engine robot would. The robot can index words, but it can't interpret graphics. You may need to change the design of your site to make it more easily understood by search engine robots. While images make your Web site pleasing to the eye, you must surround them with enough words to place them in context. For example, an online florist shop with pretty photos of flowers should also contain descriptions of the floral arrangements and services. Search engines also have difficulty understanding pages created using frames, so you should strive to eliminate frames from your site. Search engines view page titles as important indicators of content. A home page title that reads "Home Page of ABC Distribution Inc.," will do little to attract search engine visitors who haven't already heard of your business. Change the page title to be more descriptive of your products and services. Consider the search terms that would be used by the visitors you wish to attract. For example, "Widgets, Chicago, IL: Low prices and fast service on widgets from ABC Distribution" will attract people seeking to purchase and service widgets in the Chicago area. How do you know your changes are working? Start by using tools to see where your current Web site visitors are coming from, then monitor the results after you make changes to your pages. Most Web site host services retain logs with information about which visitors view which Web pages. For visitor analysis, the referer log is key. This log lists the pages that referred, or sent, visitors to your Web site. In the case of search engine referrals, the log also lists the keywords that the visitor used to obtain the results that led to your page. If you don't have access to your Web logs or find them too complex to understand, third-party services will do the work for you. Google Analytics is full-featured and provides in-depth analysis of all visitors to your Web site. But I find it delivers a little too much information for the neophyte. 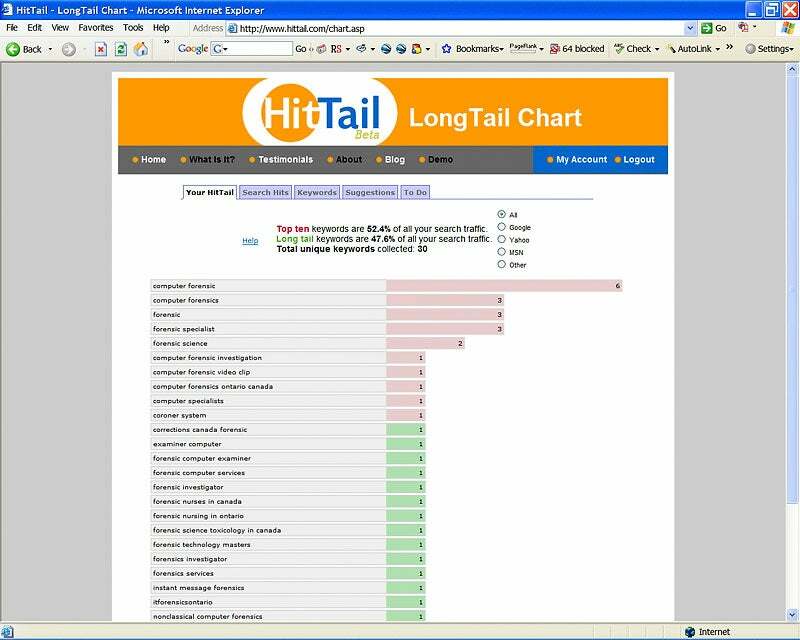 HitTail collects information about the search phrases used by your visitors. You'll see its findings when you log in to your account. The service also offers suggestions about underperforming search terms so you can create new Web content to emphasize these words. The idea is to increase the number of visitors who use the words as search terms. After you change your Web pages, remember to follow up to review the results. Your changed pages should be indexed by search engines within a few weeks, and the results should be reflected in visitor traffic within three months. If you do it right, more Web site visitors should translate to more leads for selling your products and services.